As much as i love to talk non stop about fabulous shoes, it’s important i share tips on how to get the best out of them too. Today’s post is all about shoe storage in a small space. So, you’re a shoe lover and you buy shoes as often as you get your monthly cycle. Soon enough, you have your shoes scattered all over the place or mounted on top of one another, because you no longer have any more space to store them. Apart from the fact that not properly storing your shoes can damage them, it’s not exactly a pretty sight seeing them mounted in corners or shoved underneath the bed. 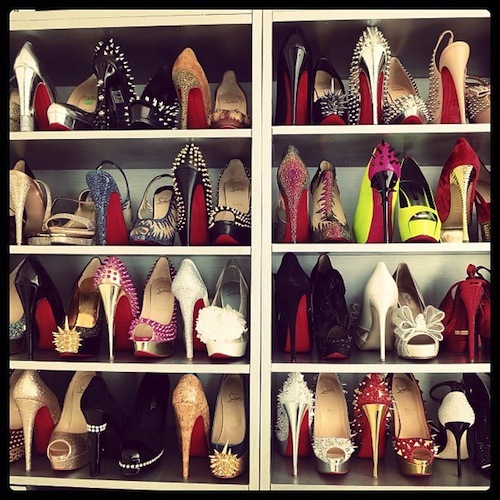 This is why i have decided to share 5 ways to store your shoes without worrying so much about space. Well, if you’re going to spend a lot of money on cute shoes, i bet you’d want a nice view of them too. There’s this really good feeling that comes with neatly arranged shoes. Invest in a decent shoe shelf that can take up the side of a wall in your room or walk in closet. Ensure it is built in such a way that there’s adequate space for easy reach and so that your shoes don’t rub against each other. An ottoman is one piece of decorative furniture that i like especially in the bedroom. One adequate size of this piece will serve three purposes. Fancy having this in your bedroom or your closet. You can store your flat shoes and sandals in them, leave the top open when you’re not seating on it to allow for the shoes to breathe. This used to be a popular option when i was growing up, i remember i had one when i was in secondary school. With shelves and racks taking over, it slowly faded out. 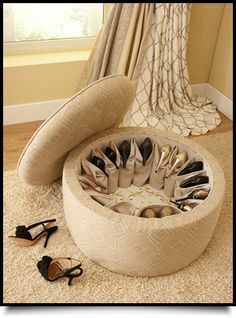 Dealing with lack of floor space or wall space?, this should make a comeback for your shoe storage. Invest in a sturdy one that can support the weight of your shoes when you hang it on the door. Clear pockets will also give a lovely display for colored shoes. Who said they can’t be used for other things? Still in need of more space to neatly arrange your shoes? Three or Four rows of curtain rods will save the day. All you need is wall space and voila, you have your shoes sitting pretty. If you’re just setting up your space or planning to, you can get a TV Stand/ Room divider that looks like the one in the picture below. This can hold your decorative pieces, photo albums, Remote controls and a few pair of shoes for effect. Store the more delicate materials in breathable shoe boxes or bags. Keep the room well ventilated at all times. Clean your shoes as often as possible. Got any other ideas to share? I have a few more, but until next time. If you have read this post and adopted any of the ideas, drop a sentence in the comment section. In recent times, i’ve learnt to adapt with the sharing of space. I just do a pair of mine and a pair of his in each storage area. i just make it look pretty. LOL!!! shoe boxes all the way though, for longevity. Okay, now I know better, but I do only flats. So what do you suggest? Hey love, it doesn’t matter the type of shoes. What’s most important is the space that you have. Your best option will be what would work for the space you’re in. DIY For Love This Valentine’s With Glitter – Take Your Shoes From Bleh To Glam.